Self-working card tricks are often considered somewhat condescendingly. But the fact is that strong magic is all about being entertaining, and with good presentation self-workers can be among the most baffling that there is. 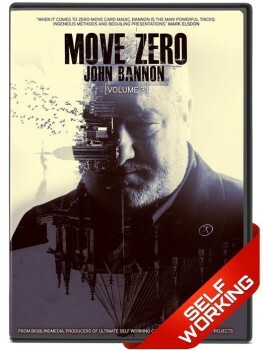 The Move Zero series from Big Blind Media features some great self-workers from one of the best thinkers in card magic, John Bannon, who is highly regarded for his clever psychological approach. In this series of four videos Bannon doesn't use any sleights, gaffs, or gimmicks, and yet constructs magic that is strong, surprising, and powerful. The first two volumes included eight and ten great tricks respectively, along with a host of other tips and procedures. Move Zero (Vol 3) continues that winning formula with another nine tricks, along with five "trickbag" sections that give additional hints to strengthen your magic. As with the previous volumes in the series, Move Zero (Vol 3) is available either as a DVD or a digital download, and follows the same basic formula. 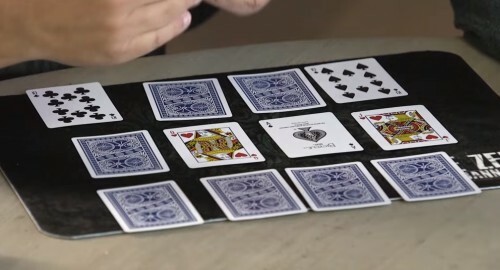 The video has live performances of each effect to various spectators, followed by an explanation of the trick in a sit-down session with BBM staff. And besides the nine tricks that are covered in detail, there are also additional "trickbag" material and interview segments. 1. The 32nd Sense: The spectator shuffles the deck and takes out a small group of cards that they count, and then remember the card at that position in the deck - which matches a prediction made before the trick even began! This is a strong trick that is well-structured and can be very fooling. 2. Mousetrap: The spectator merely thinks of a card at a secret number, which is then revealed by appearing in a sandwich between two queens. This uses a similar principle as the previous trick, but an alternate approach to the revelation makes it feel quite different. 3. Candy Crush: The spectator inserts a business card into the deck, and the words "Suit" and "Value" on either side of this card are used to construct a card. They "spell" this card by dealing cards one at a time, and amazingly arrive at the very card just generated! This relies in part on Bill Simon's Prophesy Move taught in the trickbag section, and requires some set-up, but can be very baffling - it's probably one of the more powerful tricks in this collection. 4. 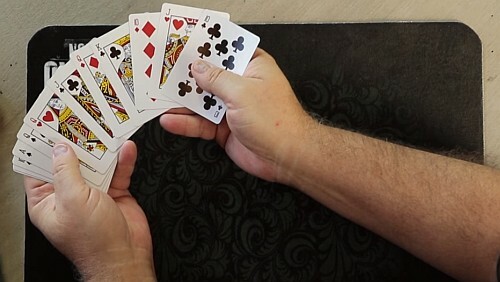 Poker Pairadox: The patter here revolves around Texas Holdem as a number of court cards are shown, and after a card is removed by a spectator, these magically arrange themselves into matching pairs. This works well as a poker-themed packet trick, and again makes good use of the Prophesy Move. 5. Origami Poker: Various cards are mixed into each other face-up and face-down, dealt onto the table in a matrix, and then rows/columns are "folded" over, creating a remarkable result where the only face-up cards are a royal flush. I've seen several variations of this self-working method previously, and the poker theme makes it work especially well here. 6. Origami Prediction: This is similar to the previous trick, but instead of a poker theme the outcome matches a prediction made in advance. It's fairly easy to set-up impromptu, and is arguably even more fooling than Origami Poker, given the plot and how fairly the cards seem to be mixed. 7. Big Bad Add: Two spectators are each dealt a hand of cards, from which they both choose one card to produce a two-digit number. Four numbers are so created and then added together to produce a total - which matches a prediction! This requires some basic math procedure, but can be very puzzling and baffling. 8. Cross Purposes: A random packet of cards is taken from the deck by two spectators, who each secretly count how many they have. The first spectator secretly remembers the card in the deck that is at their number, and when you then deal to the second spectator's number, it amazingly arrives at the very card of the first spectator! This has a slight Card At Any Number Feel, with a rather baffling coincidence effect that works every time. 9. Box Of Doom: You state that in a closed box you have as many cards as your spectator has removed from the deck, plus three with enough left over to make 23. Not only are you correct, but you also are shown to have predicted the card they would have stopped on! Often performed with coins, this is a nice version of The Trick That Fooled Einstein, with some great presentation. As part of their promotion of this video, BMB has released a couple of videos that show performances of selected tricks. ● Automatic Placement: Some great thinking from Ed Marlo, which is at the heart of the trick "The 32nd Sense". 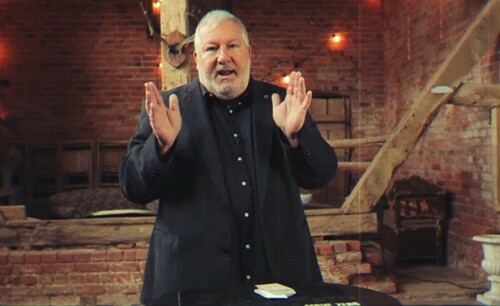 ● Prophesy Move: This is a classic move from Bill Simon that can be used to deceptively force two cards. ● The Parity Principle: This covers the Cut and Turn Over Two principle from Bob Hummer. ● Vertical Addition: This covers the number prediction used in one of the tricks. ● The Einstein Tautology: This gives a full explanation of The Trick That Fooled Einstein, used in "Box of Doom". As with the previous installments, there are also interview segments where Bannon shares his thoughts on various questions related to magic, such as his philosophy about constructing and performing magic. Tricks: This is a great follow-up to the first two volumes. I like the fact that the tricks focus on the ideas explained in the Trickbag section of the video. This particular volume probably has more variation than the ones that preceded it, so it feels like there is more variety in the routines that are taught, and they don't just rehash the same material or have significant overlap. Standouts here are perhaps the opener "The 32nd Sense", along with the two Origami routines, Candy Crush, and Poker Pairadox. I'm still partial to some of the tricks from Volumes 1 & 2 as my all-time Bannon favourites, but I like the fact that the content here feels very different from those. Utility Moves: While the first two volumes cover more well known self-working methods like the cross cut force, this volume covers methods that are less well known. 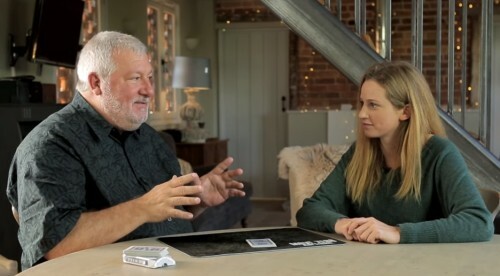 So the material here will especially be enjoyed by those who already have some experience with more common self-working card tricks, and are looking to learn new content that they may not have come across before. There are some very deceptive and clever methods at play here! Self-working: As always, this video does live up to its billing that there are zero moves, and the tricks are genuinely self-working. Bannon has a love for tricks that rely on cleverness, psychology, and subtleness rather than sleights. Accessible: The self-working nature of these tricks means that they are all well within the grasp of relative beginners. They are all relatively easy to learn and to perform. Strong: Just because something is self-working doesn't mean it is weak. There are certainly some very powerful tricks included here, and even experienced performers will find some great material that they will want to use. Teaching: John Bannon is a good teacher, and gives careful thought to every element of his performance. I especially appreciate that he explains carefully all the things that go into his presentation. There are many useful tips that he shares that explain the thinking behind his magic, and this is enormously helpful. The trickbag and interview segments of this video are arguably just as valuable as the tricks themselves. Quality production: Once again BBM has done a wonderful job in their production. They are at the top of their game, and their videos really set the benchmark for high quality filming of magic. The sound, studio lighting, and camera work is all terrific, with multiple camera angles, panning, close-ups, and everything else you'd expect from a quality video. Thumbs up all round. "The Move Zero series is amazing, and volume 3 is no exception. My favorites from this volume are Candy Crush, Poker Pairadox and Origami Poker." - Lior M.
"Once again a fabulous selection of effects, with diabolical construction and subtlety all the way. Origami Poker is worth the price of entry alone." - Michael C.
"I never expected the quality of this series to be maintained and each bringing fresh ideas not just more of the same." - Rod B. The positive comments about the two previous volumes in the Move Zero series also apply to this third volume. This isn't the kind of self-working card magic that involves lengthy counting or boring mathematical atrocities. 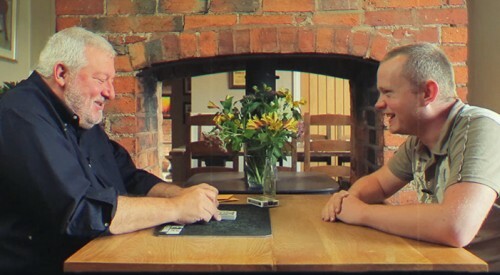 John Bannon has a very thoughtful and insightful approach to his magic, and relies a great deal on subtle psychological methods that can prove both deceptive and entertaining. Much can be learned from his approach, not the least of which is another great set of card tricks that are sure to astound. When combined with superlative production values, it is hard to think of reasons to pass up on a quality product like this, which offers more than two hours of footage. If you're looking for strong magic that is relatively easy to learn and perform, and yet has the potential to astound and amaze, you can't do much better than the Move Zero series. Volume 3 is a fine addition to a wonderful collection that showcases John Bannon's genius.